This spacious, 3700 square foot home is perfect for family & friends to gather or for couples looking to getaway for a special weekend.Great oceanfront location and views with multiple decks, make this the ideal home for those looking to relax in a clean, comfortable and tastefully decorated vacation home. A gas oven/stovetop in an oversized kitchen with granite countertops, 10 person dining room table and sunken wetbar that seats 4 (with undercounter fridge) make entertaining a breeze. All bedrooms have its own view of the ocean. For those that can't seem to get away from the office we have Hi-speed internet connection with wireless router. For kids young and old at heart, we have an X-Box with a handful of games. The sunsets, whale watching, kite surfing and ocean views are simply spectacular. Don't forget to spiral up the stairs to our rooftop deck and scan the incredible coastline. You will find no other home like this one. Located just a short walk from the Chinook Winds Casino and only minutes away from two 18 hole golf courses (Lakeside and Salishan). Access to the beach is approximately 150 yards to the north and south of front door. This particular home was custom built in 1995 by my husband and has been operating as a vacation home. 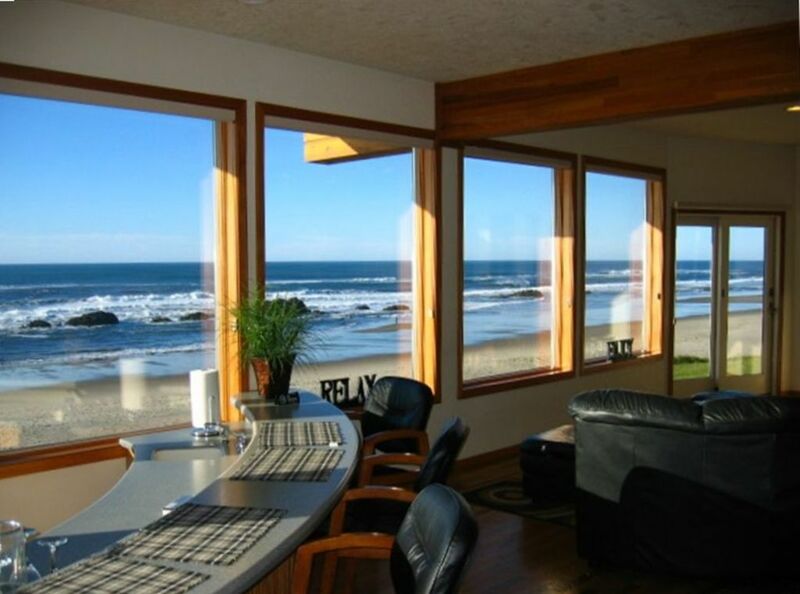 The oceanfront location and views are AMAZING! A fun and great place to spend time with family and friends. Feels like home rather than a vacation rental. We have guests that return year after year. Sand toys and board games. X-Box with a handful of games. (2) Off 2 of the bedrooms. (2) Main deck off of living area and rooftop deck for 360 degree views. Gigantic 3 sided River Rock Fireplace, Phone (local calls), Hi-speed internet with wireless router, Cable TV's, 37' TV in Living Room and 27' TV's in all bedrooms, along with a 13' TV in Jacuzzi bathroom, 2 Stereo/CD Players, Cook ware and Utensils, Place Settings for 12, For your comfort, this is a Non-Smoking home. Sorry NO pets, NO exceptions. Other Activities: Outlet shopping, galleries, kite-surfing, beach walking, storm watching & relaxing.